Forma does medical industrial design. Our exclusive focus is on medical devices and life science products. We combine beautiful form creation with thoughtful ergonomic and human factors design that works for users. We understand engineering and we design with economical manufacturability and assembly in mind from the outset. Forma’s team is experienced and smart. 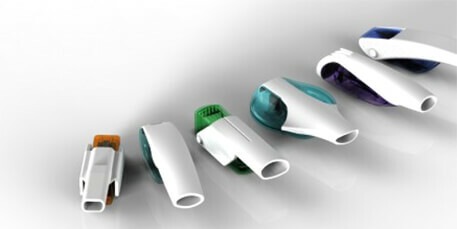 We have been designing medical products and products for the life science industry for over 30 years. We are named inventors on over 40 patents. We believe in keeping things simple. No superfluous design elements. Nothing that distracts the user. When we design a medical product, we intentionally use elements that not only advance aesthetic goals, but also serve to guide how users interact with the device, making it easy and intuitive. Device Solutions assists experienced companies to meet their resource needs during critical peak development periods. Utilizing a vast telecom experience, Device Solutions also enables clients with little or no telecom or wireless experience to concentrate on their core expertise, while Device Solutions integrates wireless, GPS, Bluetooth, and other RF capabilities into client products. Forthright Engineering provides prototype design and product development services to Raleigh, Durham, Chapel Hill and RTP NC. We can integrate with your development organization or provide all of the resources needed for an outsourced project. Our capabilities include the design of consumer, commercial, industrial and medical products as well as the development of custom equipment for laboratory, research or testing applications. Porticos specializes in Mechanical Product Development. They focus on mechanical engineering of handheld electronics, medical device design and engineering, miniature and ruggedized products and novel product development.